Set of 5 clock dials with moveable hands. Shows hours, 5 miniute, and 1 minute intervals. Made of durable sturdy plastic. 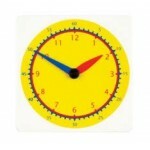 Measures 11.7cm x 11.7cm ..
28cm Analogue geared clock with second hand. Great for teaching children the time. 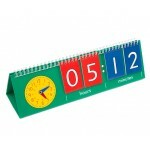 ..
Digital/Analogue Clock Dial write-on/wipe-off Set of 5 Set or 5 easy to use clock dials, ideal for reinforcing students relationship with Analogue and digital time. 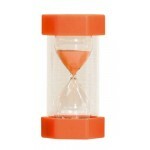 Made of durable polypropylene, the write-on, wipe- off clock dials feature moveable plastic hands to encourage student participa..
Large Tickit sand timers with moulded end caps and thick surrounding walls. For easy identification each timer is colour coded. Perfect for use in games and timing experiments eg. 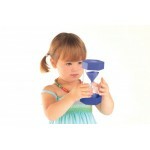 children are expected to brush their teeth for 3 minuites, great for "time out" when children are too young to compre.. This easy to read magnetic foam demo clock has large hour and minute markings, write-on/wipe-off digital time area and colour coded hour and minute hands that move. A great teaching tool. 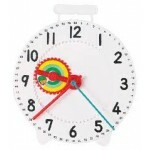 Measures 300mm x 375mm ..
Analogue Clock Class Set (1 teacher clock & 24 student clocks) These geared 12 hour clocks are designed to provide powerful models for learning to tell time The clocks are constructed with gears that replicate an analogue clock's movements, making the clock realistic and engaging to watch.. 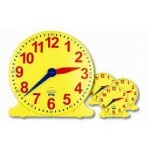 These geared 12hour clockls are designed to provide powerful models for learning to tell the time. The clocks are constrructed with gears that replicate an analogue clocks movements, making the clock realistic and engaging to watch. 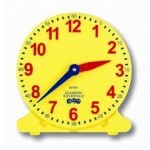 The easy to read clock face and minute markings help stude.. 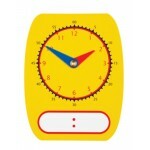 These geared 12hour clockls are designed to provide powerful models for learning to tell the time. The clocks are constrructed with gears that replicate an analogue clocks movements, making the clock realistic and engaging to watch. The easy to read clock face and minute markings help.. 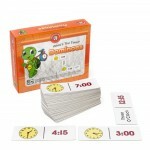 Played like ordinary dominioes, these times dominoes focus on telling time to the hour, half hour and quarter hour. Players match digital and analogue times with appropriate time language. Children will become fluent in reading analogue and digital times, along the way in which time is spokent, w..
Use this freestanding flipchart to teach the time, with matching digital and analogue time. 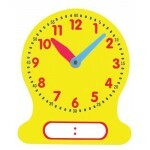 The clock face has moveable colour coded hands, easy for children to coordinate the hands on the clock face and the time on flip chart. Student size, pack of 10 measuring 32cm x 9cm. 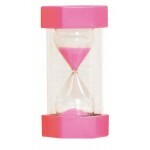 ..
Use this freestanding flipchart to teach the time, with matching digital and analogue time. 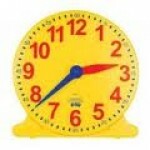 The clock face has moveable colour coded hands, easy for children to coordinate the hands on the clock face and the time on flip chart. Demo size, measuring 47cm x 15cm. 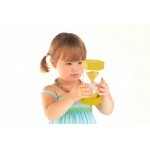 ..
What's the time snap teaches children in a fun, traditional way the skills of recognising and reading the time in analogue, digital and written word. Cards can be used to play "concentration" and "fish". 80 laminated cards (including 3 "wild" cards) comes complete with instructions in a sturdy st..